Thomco Pallet & Box is Central Canada's leading manufacturer of hardwood and softwood pallets, specialty boxes and crating. We have been manufacturing wooden pallets, specialty boxes and crates since 1958. We have 3 manufacturing plants to better serve you: Tweed, Belleville & Iroquois, Ontario. We service Ontario, Quebec and the North Eastern US. Our reputation is based on quality, service and competitive pricing. 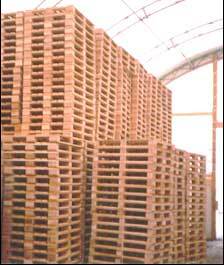 Heat treated and kiln dried pallets are our specialty. Services also include the PDS Pallet Design System, which designs a pallet based on your unit load requirements. © 2002 Thomco Pallet & Box Inc. All Rights Reserved.